Snail Solution is an intensive skin care line that contains the secretion filtrate of snails obtained from pristine areas. It makes the skin look healthy and luminous by providing vitality to stressed-out skin. Snail Solution Skin Booster contains 90% snail secretion filtrate and has a boosting function that improvement damaged skin. It brightens the skin and reduces wrinkles. 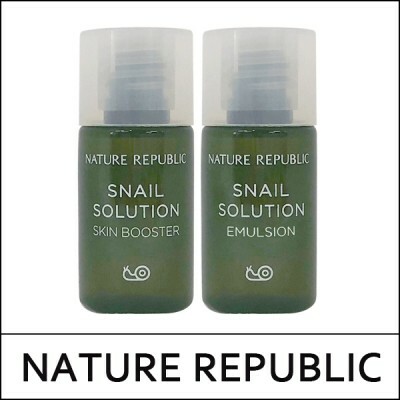 Snail Solution Emulsion contains 70% snail secretion filtrate and improvement damaged skin. It brightens the skin and reduces wrinkles. After cleansing skin, saturate a cotton pad and wipe onto the skin, starting from the center of the face and working your way out. Or dispense a dime-sized amount into palm and apply to the face in a gentle patting motion.